Published on November 27, 2018,	by admin in Adventure. For over a year now I have pondered the idea of getting a little car to pull behind Minnie. Honda has served me well over the last three years and I learned how to accomplish many chores using the bike, but somethings are just more convenient and easier with a car. It would be great to have both but I couldn’t see a scenario where traveling with a car and motorcycle would be very practical. 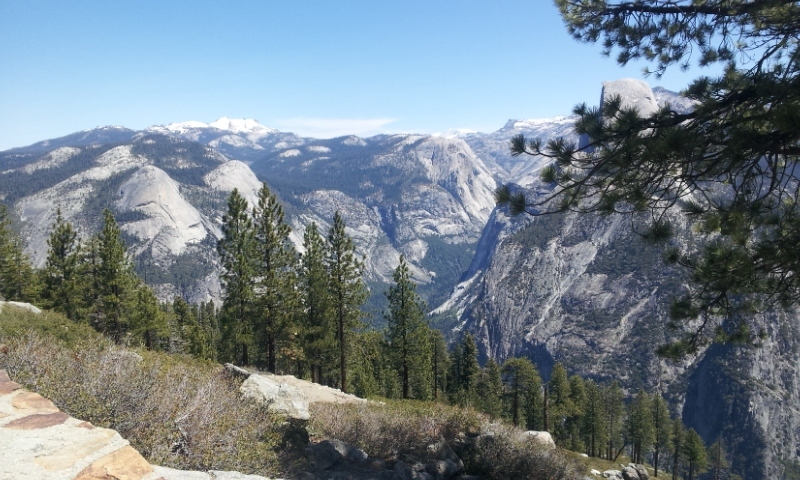 There are advantages to traveling with a motorcycle. 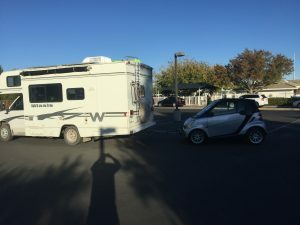 It would take me places I wouldn’t think of going in an auto, I could carry it on the back of the RV and never have to worry about backing up, and best of all I could ride for hours on a tiny bit of gasoline. I devised ways to ride for groceries, water, propane, laundry, and parts. I even rigged a tow behind trailer to haul my kayak down to the lake. Honda has been my workhorse, my escape to backroad adventure, and my travel companion for many miles over the last few years. The decision to change my mode of transportation came about by several factors. When I rode for a few hours the old body would complain about the bouncing, the hard seat, and the vibration. The weather was always a factor and long distance on a small motorcycle is just too tiring and dangerous. I finally made up my mind that a small car to pull behind Minnie was the way to go. 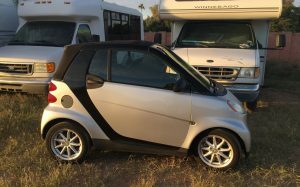 A couple weeks ago I was looking at Craigslist and saw a Smart Car for sale a few miles east of Apache Junction. I always thought that even used Smart Cars would be out of my price range but this car was something I could afford. I was 100 miles away from Phoenix at the time so I asked Daryl and Donna to go take a look at it for me. The next day they drove out and checked it out. It’s a 2009 Smart for two convertible with 69,000 miles. Daryl and Donna checked it out and drove it around a bit and texted me that it seemed in good shape. I told them to put a deposit on it and I would head back to town in the morning. Two days later I was the proud owner of my own toad! The car only cost me $3300. 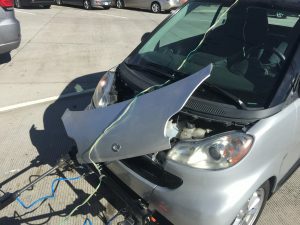 Getting it licensed, insured, and set up to be towed cost another $2000. I cleaned up Honda, put a new tire on the back, changed the oil, fixed the headlight, and advertised it on Craigslist Sunday morning. By 1:30 I had it sold for $2100. I guess I made the transition from motorcycle to car with very little pain. It’s not very fast. 0 – 60 mph takes about 16 seconds. It’s made by Mercedes so probably parts and labor will be expensive. It only seats two and there is not much luggage space. It will have limits but I think I can grow to love it just the same. Thanks to Daryl and Donna for running me all over town and helping me get things set up. Donna has experience with towing and helped me with tips and tricks on how to hook and unhook. Thanks again guys! I need a backup camera to tell when something happens. Looks like a Smart Toad. I think you’ll really love having a car. You’ll be able to go farther and carry more when you want to park your Minnie for a while. It’ll really prove its value when you need to run down to Tempe/Mesa when you are camped up on the Rim. Have you figured out a fix for the loose hood yet? For now I just put a bungee cord on it to hold it down.